It’s so awesome to be recognised and appreciated by you guys. I would like to say a massive thank you to the fabulous Laura whose blog is Pandora’s Box for nominating me for The Real Neat Blog Award. You should all go and check out her fashion and beauty blog. I love it and always look forward to reading her posts. 1) Put the award logo on your blog. 2) Answer 7 questions asked by the person who nominated you. 3) Thank the person who nominated you, linking to their blog. 4) Nominate any number of bloggers you like, linking to their blogs. 1.What made you want to start blogging? I wanted to continue being creative whilst incorporating my love for fashion and beauty. So I thought what better way to do that than to start blogging. It’s also a great way to interact with others and learn about great/not so great beauty products, make up tips, styling etc. 2.What is the weirdest thing you have ever done? 3.How would you describe yourself in 3 words? 4.If you could have one superpower what would it be? To be like Sabrina The Teenage Witch… if I could click my fingers and be ready in a second or to turn up where I needed to be in a flash, that would be awesome. No more long winded tube journeys being squished in like a sardine. 5.What is one thing you haven’t done yet but would like to try? I’d say getting engaged and married! I have never even been a bridesmaid before. But the excitement of it all and all the planning, trying on dresses etc is something I’ve dreamt of since I was a little girl. 6.What is your best childhood memory? Waking up super early on Christmas mornings and making sure my family were up by 6am as I was so excited to see whether Father Christmas and Rudolph had eaten their biscuits and carrots. The novelty of a gnawed carrot and some crumbs on the plate never wore off. 7.If you had £100,000, what would you do with it? I’d be pretty sensible and use it as a deposit for an apartment but would also use part of it for a vacation in the sun! 1.What was the first gig that you went to? 2.Who is your number 1 celebrity crush? 3.What is your biggest achievement? 4.If you could live anywhere in the world, where would it be and why? 5.What is the song that you could listen to on repeat as it’s so good? 6.What’s the one fashion item or beauty product that you just couldn’t live without and the reasons why? 7.How would you describe yourself in three words? I’m going to nominate Mei, Edith and PJ as their blogs are awesome! You should check these gals out as their blog posts are fun and interesting. 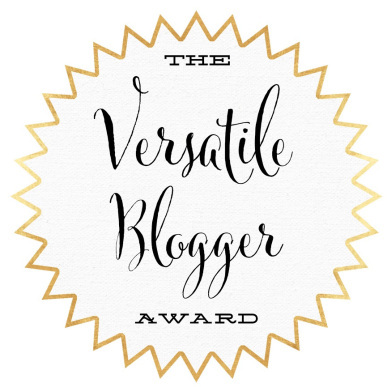 Also a big thank you goes to Natalie who nominated me for the Versatile Blog award. I’ve already posted on this previously. Finally a massive thank you goes to everyone who reads my blog and those who nominate me for awards. It means a lot!! Congratulations! People love your blog! Haha great answers and congratulations! Always love reading your blog and look forward to your entertaining yet informative posts. Keep up the phenomenal work! I think the exact same about the superpower! I always wanted to be able to do that after I watched her..aw, nostalgia for that show.